Capture All offers a secure scanning, digitising, storage and archiving service backed by many years experience delivering a professional records management service. Your bsrowser does not support the video tag. Utilising state-of-the-art Kodak scanners, Capture All can digitise all formats of paper documentation, including financial records, legal files, housing files and technical reports. Capture All offers a specialist bound book scanning service that achieves excellent results without removing the book’s bindings and risking damage to the book’s structure. Capture All can produce high quality electronic scans of large format plans and drawings in both mono and full colour. Our document storage service offers a cost effective, secure and flexible service for archiving your documents. 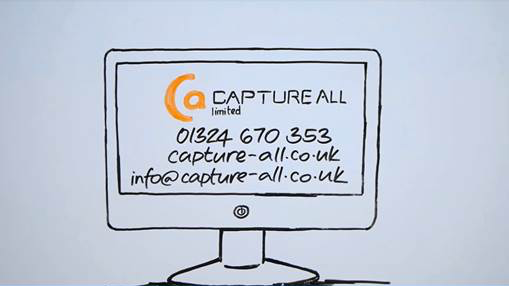 Capture All is one of the UK’s leading providers in document scanning, storing and archiving. We offer a comprehensive range of digitisation services, including document scanning, drawing scanning and book scanning. Alongside our digitisation services we offer secure document storage and a scan-on-demand service. Based in Central Scotland, we are strategically located and offer an uplift and delivery service throughout the UK. Our Mission is to build relationships with our Clients, giving each one the best possible advice on achieving the correct solution to their requirements. Our specialist staff are always willing to assist you at every stage in the process. Capture All works with businesses all across Scotland helping them reduce their document storage space and streamlining their business operations through our state-of-the-art scanning processes. Our services help businesses save time, space and money. We can integrate our services into existing management structures or consult on the design and installation of brand new systems. To learn more about document scanning, storage or archiving, call our team today on 01324 670353. Capture All works with businesses in and around Glasgow to reduce their physical document storage demands and streamline their existing document management processes. Capture All supports businesses across Edinburgh and Lothian through specialist document scanning, storage and archiving services. Our services allow companies to slash their document storage requirements and streamline their document management processes, leaving them more time to concentrate on the things that matter most. We can integrate our services into existing systems or consult on the design and installation of new systems. Capture All helps businesses streamline their operations through high quality document scanning, storage and archiving. Our services are designed to help you reduce physical storage demands, quicken your document retrieval process and improve tour document security. We can integrate our services into existing document management structures or consult on the installation of new systems.